SAWLF participants are public and private sector professionals that number over 4,000 across the U.S. Through a combination of events, mentoring, and education, SAWLF serves as a platform for professional women to meet and assist one another with individual, professional and business objectives and, ultimately, leave a network and legacy for the women that follow us to utilize and build upon. The SAWLF mentoring initiative partners SAWLF members with school age girls from diverse communities within the City of New York. Through our bi-annual conference, Congress, SAWLF is committed to providing women professionals a forum in which to interact and learn from successful women leaders from around the world. The visibility of prominent individuals who are willing to share their personal experiences of challenge and achievement is critical to the success of this program. Ms. Indra Nooyi, Chairman & CEO, PepsiCo., Inc.
Ms. Vanita Gupta, Esq., NAACP Legal Defense and Educational Fund, Inc.
Ms. Prabha Sipi Bhandari, Former VP Senior Counsel, Mergers & Acquisitions, Viacom, Inc.
SAWLF's success can be contributed to its many volunteers and speakers. They devote their time, and, in the true spirit of our organization, share their network and resources in order to support our events and programs. Since its inception, SAWLF has hosted or collaborated in over 150 distinct programs. While the majority of SAWLF events have been held in New York, in November 2005, with the support of the United Nations Foundation, SAWLF launched a new program initiative in Washington DC. More recently, SAWLF expanded its programming to the greater Chicago area. April 22, 2010: SAWLF welcomes high school participants and corporate partners for our third annual Take Our Daughter's to Work Day. SAWLF has been seeking opportunities in which to expand our leadership and educational programming to include girls. Our program, in the opportunity to meet and shadow South Asian women professionals in positions of leadership, responsibility and authority. The collaboration offers SAWLF members the chance to share their experience and directly impact young women at a critical stage of their personal development. Student participants are between 14 to 19 years of age and represent New York City high schools in Queens and Brooklyn. On February 23, 2010, Leading women professionals in the fields of publishing, media and journalism addressed SAWLF members on the topic of the writing for print and publication. Due to overwhelming interest in our February 23 event - this event is now sold out. Walk-in registration will not be permitted. Please join us on April 1, 2010 for "Non-Traditional Careers in Finance" Additional information will be posted shortly. On Tuesday, February 23, SAWLF will bring together leading women writers, journalists and industry professionals for a dynamic conversation on the Who, What, Where, Why, When and How of writing for print and publication. SAWLF cordially invites you to a special interactive event on Wednesday, April 30, 2014 from 6:30 - 8:30 PM. Join us as we discuss the topic of "Personal Branding" with senior marketing professional Sumita Singh, SVP, Marketing, Corporate Markets, Elsevier (Science and Technology Division). Ms. Singh will share specific examples of steps women professionals can take in order to advance their personal and professional brand. Ms. Singh will also highlight ways in which women professionals can leverage digital marketing tools and platforms in order to reach their desired outcomes. Sumita Singh is the Senior Vice President of Marketing, Corporate Markets for Reed Elsevier�s Science and Technology Division based in New York. In her role, she is responsible for defining and leading the strategic marketing and e-commerce efforts for a high-growth business unit through both organic and inorganic initiatives, growing lead generation by 200% and revenue conversion by over 25% in a year. She leads the group�s worldwide multi-channel marketing communications strategy and agency relationships. Prior to Elsevier, Sumita served as the Senior Vice President of Strategic Marketing for Thomson Reuters Financial & Risk where she built the global center of excellence in marketing services, customer intelligence and strategic marketing as well as the company�s internal marketing services group. She previously held similar roles at WebMD and New York Media. Clueless about quinoa? Curious about kale? How do stress and sugar effect my well being? What should I feed my kids? Join SAWLF on Tuesday, June 4 (7-8:30 PM) for a dialogue with author and holistic health counselor Rachel Khanna. This event will take place in Greenwich, CT as part of the new SAWLF CT/Westchester event series. This year, SAWLF marks its 10th anniversary and will celebrate with the return of its signature event, Congress, on Saturday, March 9, 2013. SAWLF welcomes American designer Rachel Roy as the event's closing keynote speaker. 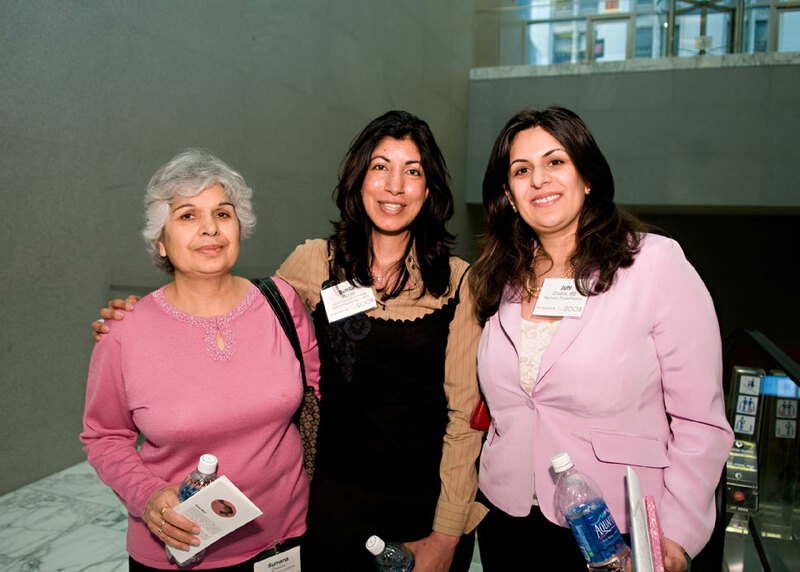 Congress is the largest single gathering of South Asian women professionals to be held in the US and is the country's premier forum for South Asian women professionals. Don't miss your opportunity to join over 400 leading women professionals for this transformative event. Congress is presented by PricewaterhouseCoopers and will take place at their Midtown Manhattan offices located at 42nd Street and Madison Avenue. Please visit www.southasianwomen.org/congress for additional event information and registration. SAWLF invites you to kickstart 2012 by joining us for our first event of the new year. On Tuesday, January 24, the chef and culinary creative director for Junoon, Aliya LeeKong, joins SAWLF for a special tasting reception and dialogue on her remarkable transition from the corporate sector to the culinary arts. Celebrate the season with SAWLF, friends and Cynthia Rowley. This special event will take place from 6 - 8 PM on Tuesday, November 29, 2011. Cynthia Rowley has long been a fashion and style authority, with a namesake collection that includes women's wear, beachwear and wetsuits, men's wear, eyewear, handbags, shoes, baby, home sewing products, tools, legwear, shapewear, and 'dress-up' band-aids, not to mention a mobile fashion unit: the Cynthia Rowley Shop on Wheels. Cynthia has appeared on "Project Runway" and "America's Next Top Model," and her work has been featured in nearly every major magazine and newspaper domestically and internationally. She has received an award from the Council of Fashion Designers of America (CFDA) for her women's collection as well as an acknowledgment from the Council for her menswear designs. As a best-selling author of the Swell series, Cynthia has five books to date; her most recent, Slim: A Fantasy Memoir, was published by Rizzoli and includes her original drawings. She is a mother to two daughters and is married to Bill Powers, co-owner of HALF Gallery and judge on Bravo's competition series "Work Of Art." An art enthusiast herself, Cynthia has collaborated with artists Will Cotton, Nick Cave, Olaf Breuning and Ryan McNamara on various ventures and collections, and has designed a capsule for the Gagosian Gallery, a collaborative exhibit for MoMA's PS1, and co-founded the groundbreaking art retail site Exhibition A. The Cynthia Rowley Collection is sold in better department, specialty and online stores, as well as in approximately sixty Cynthia Rowley shops around the world. SAWLF Is pleased to welcome serial entrepreneur, philanthropist and "Mother Theresa CEO" author Ruma Bose on Tuesday, October 4, 2011. Ruma authored the bestselling book, "Mother Teresa, CEO" which demonstrates the management and leadership principles of Mother Teresa that led her to create one of the world's largest and most successful organizations. Ruma spent time working with Mother Teresa and leverages the lessons learned into a set of guiding principles for successful leaders. In addition to her book, Ruma is currently President and co-CEO of Sprayology, an innovative wellness company that sells vitamin and homeopathic oral sprays. Previously, Ruma worked as a venture capitalist, advisor and executive to and with many early stage companies in the consumer industry. She was President of a leading international cosmetics brand and advised several luxury brands as a Managing Director at Sage Beauty Group and Senior Director at Roseworth Capital. Ruma currently serves on the Board of SecretBuilders, an online children's edutainment firm. She also serves on the non-profit Boards of SEED NY and Kopernik. Support "SAWLF Mentors" on Tuesday, May 24, 2011 from 6 - 8 PM. SAWLF Mentors partners underserved South Asian girls between 12 - 18 years of age with SAWLF members representing diverse professionals for job shadowing, mentoring and education. Meet special guest speaker Ms. Shazi Visram, founder and CEO of HAPPYBABY on Wednesday, May 11, 2011. Additional details to follow. On Saturday, April 30, 2011, Team SAWLF will be participate in the 14th Annual EIF Revlon Run/Walk For Women for the 6th consecutive year. Join the Walk - or Support Team SAWLF (Team #1465). For additional information, contact Arti Dua, Team SAWLF Captain at: contactartidua@gmail.com. Join SAWLF Mentors for our 4th annual Take Our Daughter to Work Day event on Thursday, April 28, 2011. South Asian Women's Leadership Forum Women in Finance cordially invites you to a special event featuring leading women in hedge funds. This special presentation will showcase the experiences of senior women at New York hedge funds whose roles include investing and portfolio risk management functions; macro-economic analysis; and trading and research of individual sectors. Our guest speakers will share their experience of challenge and achievement as well as offer insights into the dynamic hedge fund industry including advice for women with a passion for investing. Wednesday, June 23: SAWLF Presents Women in Fashion featuring special guest speaker Jyothi Rao, General Manager for Women's at the Gilt Groupe. Jyothi Rao brings to Gilt Groupe extensive experience in the retail sector with a focus on merchandising. Most recently, she served as a senior vice president and general manager at Calvin Klein, where she launched the Specialty Retail division. Prior to that, she spent 16 years at Gap Inc., where she held several leadership positions and was responsible for aggressively growing both the regular-price and outlet businesses for Gap and Banana Republic. Jyothi, who has resided in Africa, India and Europe, also helped Gap International succeed in more than doubling its sales in Japan, France, the U.K. and Canada. She was educated at the University of Texas at Austin. Please visit: http://www.ersvp.com/r/event8006/main for additional event details. In April 2010, SAWLF launched a new event series designed to explore how women professionals experience change and career transition. Invited speakers will share their experiences of transition which, for some, was initiated by desire and choice (seeking career change or new opportunity) and, for others, out of necessity (due to relocation or down-sizing). Our April 5, 2010 featured Roopa Purushothaman, MD, Head of Research, Everstone Investment Advisors Pvt. Limited, Mumbai, India in conversation with Komal Dhall, a principal for KPMG. This session highlighted Roopa's transition from Goldman Sachs (New York) to a new professional opportunity working in Mumbai, India. Roopa discussed the opportunity she sought and the challenges she has discovered working and living in one of the world's fastest growing economies. SAWLF continue our series on Tuesday, May 18, 2010 with Tanuja Prasad and entrepreneur Sarita Ekya. Sarita is the owner of East Village favorite S'MAC (Sarita's Mac and Cheese). A former engineer, Sarita will share her experience of transition to New York City restaurant owner. Tanuja will discuss her transition from the field of technology on Wall Street to new non-profit opportunities in New York and India. Additional panelists will be announced. This event will feature Roopa Purushothaman, MD, Head of Research, Everstone Investment Advisors Pvt. Limited, Mumbai, India. This special session will highlight Roopa's transition from Goldman Sachs (New York) to a new professional opportunity working in Mumbai, India. Roopa will discuss the opportunity she sought and the challenges she has discovered working and living in one of the world's fastest growing economies. On November 13, 2009, SAWLF launched Women in Fashion (WIF) with panelists Rosena Sammi (Rosena Sammi Jewelry); Rakhee Mirchandani (New York Post) and Mili Dutt Reddy (Louis Vuitton NA). WIF will offer quarterly networking and career development opportunities for women professionals in New York City's dynamic Fashion industry. Sarita Gupta joined WWB in July 2007. She is responsible for ensuring that WWB meets its annual fundraising goals, is positioned for strategic growth, and remains a thought leader in the sector through its publications and speaking engagements. Sarita has a 25-year career in the non-profit sector, encompassing program development, fundraising, communications, marketing and management. Just prior to joining WWB, she headed the fundraising and communications efforts at Acumen Fund, which seeks entrepreneurial approaches to alleviate global poverty; and before that held successively higher fundraising and management positions at CARE, a leading humanitarian organization. Sarita has also worked for the American Friends Service Committee, the Asia Society, and a U.S. State Department-funded project on refugee resettlement. Sarita holds a Masters degree from the School of International & Public Affairs at Columbia University, and a Bachelors degree from Miranda College, Delhi University, India. It is the special responsibility of the Community Affairs Office to gather grass-roots intelligence and analyze emerging issues affecting low to moderate income communities in the Second Federal Reserve District. Additionally, the Community Affairs Office convenes stakeholders to provide information and technical assistance related to community and economic development. Ms. Hamdani holds a doctorate and two master's degrees from Columbia University. Her bachelor's degree is from Western College for Women in Oxford, Ohio. Moderator S. Mitra Kalita, Editor, The Wall Street Journal S. Mitra Kalita is an editor at The Wall Street Journal, and the author of Suburban Sahibs: Three immigrant families and their passage from India to America. She was most recently the deputy global economics editor, handling coverage of the global financial crisis. At the Journal, she anchors the weekly column, New Global Indian. Most recently, she helped launch Mint, a business newspaper in New Delhi, as a founding editor, columnist and member of the editorial leadership team. Beforejoining Mint, Mitra was a reporter at the Washington Post, Newsday and the Associated Press. She has covered a wide range of general assignment and business stories, including the impact of 9/11 on New York City's economy, on immigration and on South Asians and Arabs.She has spent much of her career writing about immigration, globalization and emerging economies, especially India. She is currently at work on two books, an economic memoir of India and a workplace manual. A native of Brooklyn, Mitra grew up in Massapequa, Long Island; Puerto Rico, and West Windsor, N.J. Mitra has a BA in history and journalism from Rutgers University and a master's degree from Columbia University Graduate School of Journalism. She has received many awards and her work is included in an anthology of the "Best Business Stories." She is a past president of the South Asian Journalists Association (SAJA). Mitra is married to Nitin Mukul, an artist. They have a 5-year-old daughter and live in Jackson Heights, Queens.